The recession has hit a lot of families hard, and others are trying to cut back on holiday gifts to help children understand that people, not things, are most important. 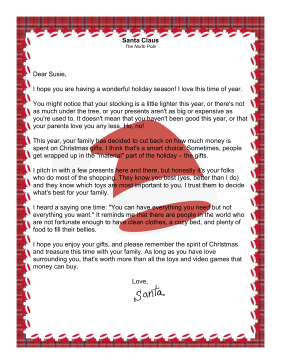 In this letter, Santa gently lets kids know that there will be fewer gifts under the tree this year. I hope you are having a wonderful holiday season! I love this time of year. You might notice that your stocking is a little lighter this year, or there's not as much under the tree, or your presents aren't as big or expensive as you're used to. It doesn't mean that you haven't been good this year, or that your parents love you any less. Ho, no! This year, your family has decided to cut back on how much money is spent on Christmas gifts. I think that's a smart choice. Sometimes, people get wrapped up in the "material" part of the holiday � the gifts. I pitch in with a few presents here and there, but honestly it's your folks who do most of the shopping. They know you best (yes, better than I do) and they know which toys are most important to you. I trust them to decide what's best for your family. I heard a saying one time: "You can have everything you need but not everything you want." It reminds me that there are people in the world who are not fortunate enough to have clean clothes, a cozy bed, and plenty of food to fill their bellies. I hope you enjoy your gifts, and please remember the spirit of Christmas and treasure this time with your family. As long as you have love surrounding you, that's worth more than all the toys and video games that money can buy.